The reason for this post is to give thanks to an unsung kitchen utensil – the mortar and pestle. The reason for the Wilde quote? There's nothing particularly decadent about my mortar and pestle, but sometimes I do feel honoured to have it in my possession. It's just so...useful. Like all mortars and pestles, a Thai Mortar and Pestle is used for grinding foods into various stages of coarseness/fineness, and for making sauces. Smaller ones (6 inches wide at top, 7 lbs) are used mainly for nuts and seeds, while larger ones (which can commonly reach 9" wide, hold 6 cups - and weigh 24 lbs) are used for blending sauces as well. The weight of the stone adds stability, an important aid for the tasks you will want to perform. 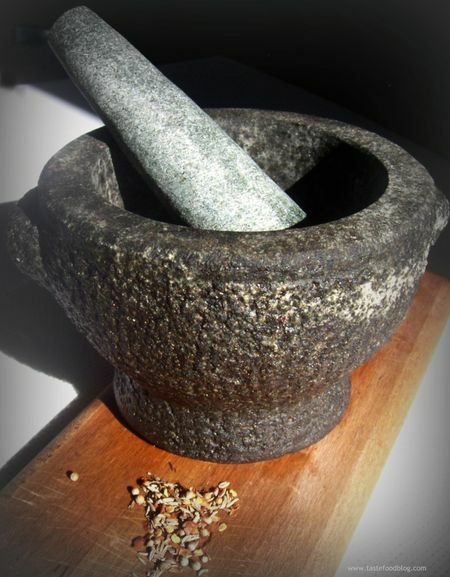 Traditional Thai mortar and pestle sets are made of only two kinds of materials: granite or clay. Most common, non-porous granite is excellent for crushing seeds as well as preparing crushed vegetables and spices into sauces. Northern Thai clay versions, commonly taller than their granite cousins, are most often used for specific dishes, such as som tam (green papaya salad). The mortar and pestle was used throughout history by many cultures and the preparation technique has even influenced the name of dishes prepared with its use. "Pesto" is a shortened form of the Italian pestare which means "to pound or crush". Ours is dedicated to grinding pepper, but if the need arises it is easy to clean with soap and water. Just be certain to carefully rinse out any soap residue before use. The best place to find them at good prices is one of two places – either your local Asian grocery, or Winners/HomeSense. I wouldn't be without one.